Following completion of embryonic development, C. elegans first stage (L1) larvae emerge from the eggshell and begin feeding. Under conditions of plentiful food and low population density, larvae pass through 4 larval stages (L1, L2, L3, and L4) before molting into reproductive adults. Characteristic developmental events take place in each larval stage. C. elegans larval development is genetically predetermined and occurs regardless of environmental factors, with one important exception. During a short time window, L1 larvae select one of two alternative developmental pathways in response to environmental conditions. In prosperous environments with plentiful food and low population density, L1 larvae select the reproductive pathway and develop directly through the L2, L3 and L4 stages. Under these conditions, development into reproductive adulthood occurs within 2-3 days. In contrast, harsh environments with little food and overcrowded conditions trigger L1s to enter diapause and arrest development as dauer larvae, an alternative 3rd larval stage (DIntroFIG 1 & DIntroFIG 2) (Cassada and Russell, 1975; Golden and Riddle, 1982). Dauer formation requires energy and, therefore, the presence of food in the environment. In fact, all processes that occur during post-embryonic development require a food source for energy. L1 hatchlings encountering an environment devoid of food fail to initiate post-embryonic development and enter L1 arrest in response to starvation (Baugh, 2013). In contrast, environments with limited food and high population density are permissive for postembryonic development, yet not conducive for reproduction and population growth. Such conditions trigger L1 development into L2d and, subsequently, dauer arrest. Dauers are developmentally-arrested and non-feeding, but they are motile and explore the environment in search of food sources (Ward, 1973; Cassada and Russell, 1975). Dauer-specific behaviors, such as nictation (see Dauer Behavior - Nictation) also enable dauers to be carried along by passing objects for transport to new environments. 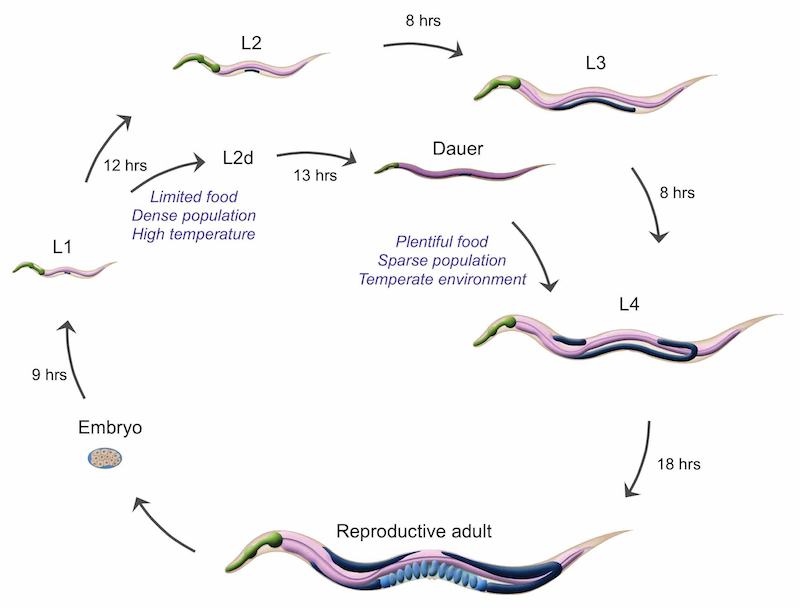 Once dauers encounter a food source, they resume reproductive development by molting into L4 larvae and, subsequently, into reproductive adults (Cassada and Russell, 1975). 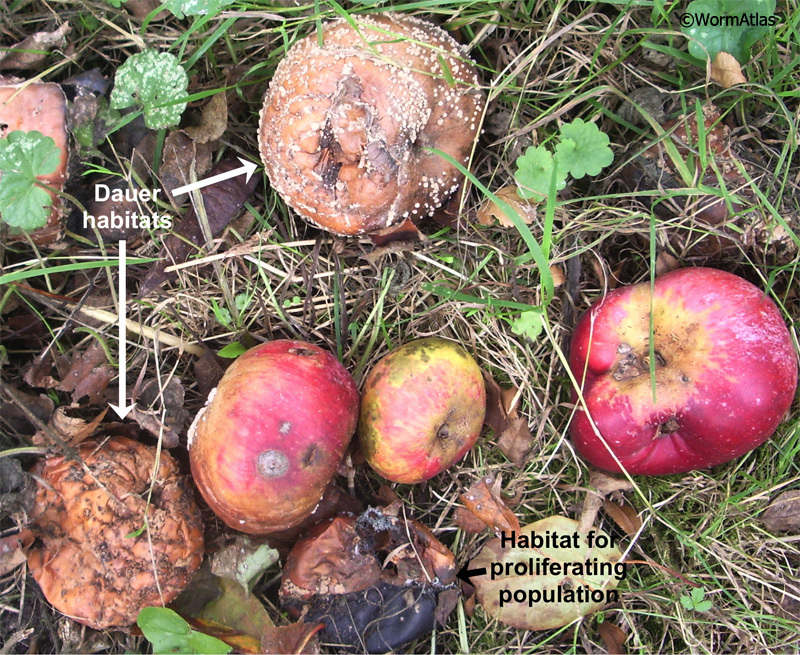 Interestingly, dauer recovery is inhibited by high population density, even in the presence of adequate food. This indicates that dauer recovery is optimized for environments that offer a competitive advantage to new inhabitants (Cassada and Russell, 1975). An example would be a newly-formed compost pile which lacks an existing nematode population. The dauer branch of the C. elegans life cycle provides a means for C. elegans to propagate and populate a wider area than would otherwise be possible. 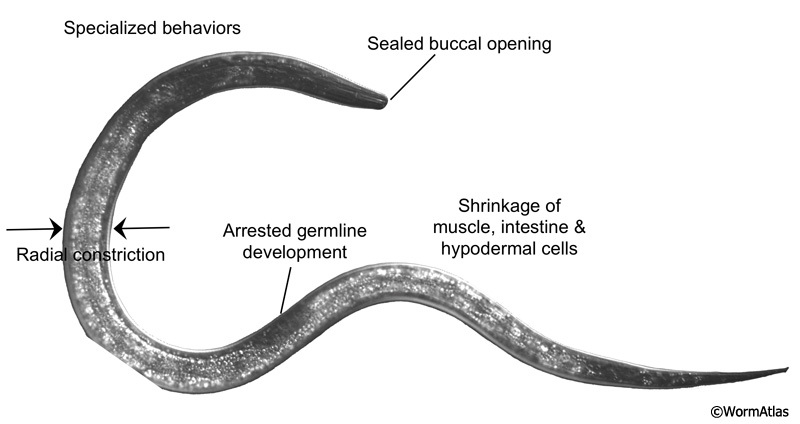 Parasitic nematode species utilize the same type of developmental pathway to generate long-lived “infective juveniles” that can better survive harsh conditions while searching for a new host. Upon entering a suitable new host, the infective juvenile (dauer) will molt into the L4 stage and resume reproductive development while feeding on the new host. 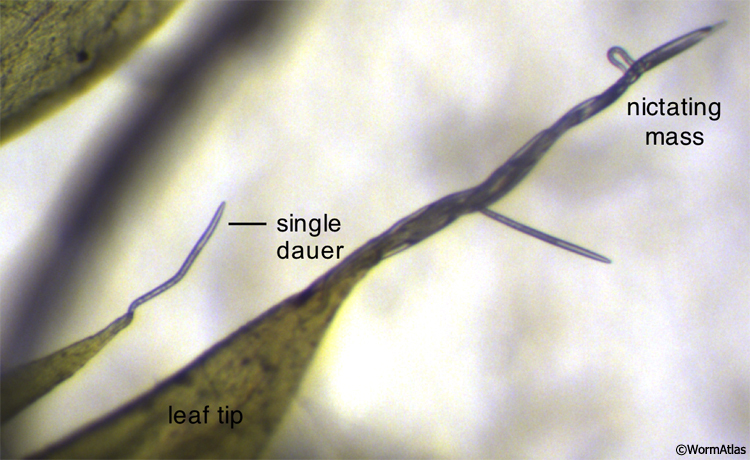 Specialized adaptations allow dauers to survive for long periods of time under harsh conditions (DIntroFIG 3) (see also Dauer Cuticle). Dauers possess a thick protective cuticle that covers the entire body and occludes the buccal cavity (Albert and Riddle, 1983). The dauer cuticle protects the animal from environmental insults, such as toxins and detergents (Cassada and Russell, 1975). In fact, a classic method for isolating dauers from mixed-stage cultures is to treat an overcrowded population with a solution of 1-2% SDS until only the dauers remain (Cassada and Russell, 1975; Hu, 2007). Within the cuticle, the dauer body is radially constricted and cells are compacted. Radial constriction depends on the autophagy pathway, which removes and recycles intracellular material and wastes (Meléndez et al., 2003). During dauer remodeling, autophagy processes shrink cells by catabolizing cellular components not needed during diapause. After dauer remodeling is complete, the strengthened dauer cuticle encloses the remaining cellular structures within a smaller volume (Cox et al., 1981). This thinner, stiffer body presumably helps in performance of specialized dauer behaviors, such as nictation and jumping motions. During the dauer stage, the presence of a buccal covering prevents feeding and dauers cease pharyngeal pumping (See Dauer Pharynx). As a consequence, dauer larvae depend on intestinal and hypodermal lipid stores as a source of energy (See Dauer Intestine). Dauers are resistant to high temperatures, oxidative stress and anoxia (Anderson, 1982; Larsen, 1993). In part, this is due to increased expression of protective enzymes, such as SOD (Larsen, 1993). Dauers can express high levels of the disaccharide, trehalose, to confer resistance to desiccation (Erkut et al., 2011). Trehalose is thought to stabilize membranes under conditions of dehydration. Dauers also induce several other stress-response pathways for desiccation tolerance (Erkut et al., 2013). Dauers display specialized behaviors that facilitate the twin goals of survival and dispersal (See Dauer Behavior). The first of these is nictation, when the larva lifts its body off the substrate, waving its head in the air (Cassada and Russell, 1975; Dauer Behavior - Nictation). Dauers can also nictate in large groups, entwining their bodies into a living, waving rope (DIntroFIG 4; DBehaviorVIDs 3, 4, and 5). Nictation allows dauers to find and attach to passing animals or other moving objects, hitching rides to new environments. A second dauer-specific behavior is the characteristic locomotory pattern. Dauers tend to lie motionless for long periods of time and then respond briskly to stimuli (See DBehaviorVid 1) (Gems et al., 1998; Cassada and Russell, 1975). In contrast, nondauers continuously explore their environment, either feeding or searching for food (See DBehaviorVid 2). The dauer locomotory behaviors may allow them to conserve energy, unless threats are sensed at which point they will move rapidly away from the source of stimuli. Finally, dauer larvae cease pharyngeal pumping (Cassada and Russell, 1975). Since closure of the buccal cavity prevents feeding, pharyngeal pumping is an unnecessary energy expenditure for dauers. Hu, P.J. 2007. Dauer. In WormBook (ed. The C. elegans Research Community). WormBook, doi/10.1895/wormbook.1.144.1. Edited for the web by Laura A. Herndon. Last revision: January 15, 2015.